The HAZOP e-learning course enables you to learn all aspects of the Hazard and Operability Study, which is a popular Risk Assessment technique used in industry. This unique course covers in depth everything in detail such as Basic Concepts about Process Hazards, Risk Assessment, the HAZOP technique with various Guide Words, Computer HAZOP technique (CHAZOP), sample templates to do your own Hazard and Operability Study and a Real Life Case Study. The course consists of several modules as given below. After you complete this course, you can take an online certification exam that entitles you to an electronic certificate and badge on passing. 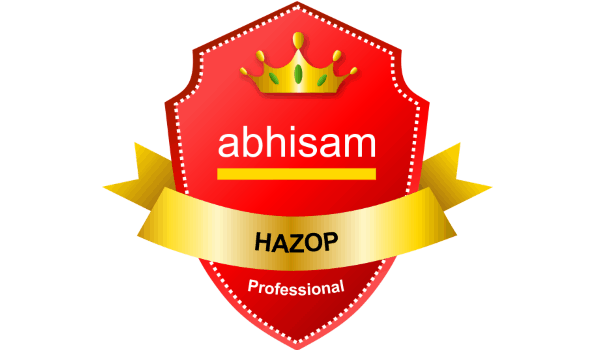 The Badge can be displayed online on places such as LinkedIn and Facebook, showcasing your skill set in HAZOP. This is a great way to demonstrate your capability to current and prospective clients and employers.